The Lexus LFA had a good run. Lexus built a total of 500 worldwide. They were upsettingly expensive. One hundred seventy-eight came here. And in the December of 2012, production ended. Lexus sold each and every one of them, right? Or did they? While digging around automaker sales figures, Autoblog was surprised to discover that Lexus sold one LFA this year and six last year. A Toyota spokesperson confirmed to the outlet that there are currently 12 LFAs in the United States that are classified as “dealer inventory.” How did this happen? Basically, for the U.S. market, Lexus said the company intended to only take purchase orders on LFAs from customers to avoid price gouging and speculation. However, in 2010, orders started to drop off, and to make sure cars weren’t sitting at the factory, the company allowed existing LFA holders to order a second car, and also allowed dealers and executives to order cars for themselves or for selling at dealerships, and some of the dealer-ordered cars still come up from time-to-time as new sales. It’s been five years since the end of the LFA’s production. If the cars are still on dealer lots, it probably means that selling them isn’t a terribly high priority. Perhaps the cars are being held onto as collector’s or show pieces. The LFAs certainly aren’t listed anywhere. A search through Autotrader and DuPont Registry yielded only used LFAs and a glance through Cars.com showed one LFA with zero miles on the clock at a Lexus dealership in Carlsbad, California. After calling the dealer to confirm that the car really had zero miles on it, we were told that the Cars.com listing was inaccurate and that that particular LFA was actually used and had 1,300 miles on it, however. I’m so curious now. Would it be possible for you or me (well, if we were, like, $400,000 richer) to purchased a brand-new 2012 Lexus LFA in 2017? And for how much? 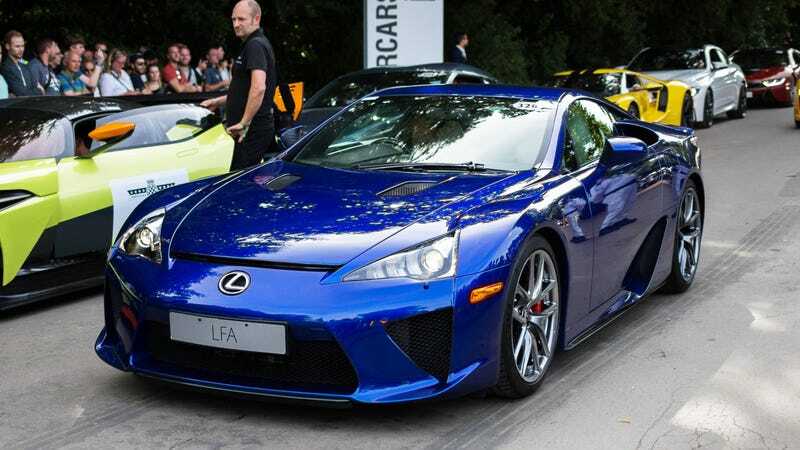 The dark blue LFA in the photo above was taken at the 2017 Goodwood Festival of Speed. It’s very similar to the LFA used in all of the Lexus UK press materials, which makes me wonder if Lexus held onto a couple LFAs to show-pony at events. I can confirm that there are still 12 LFAs in dealer inventory. While I can’t confirm which locations, several dealerships still have LFAs on display or on their lots as showcase vehicles.